By Janet McNally It has always been my contention that sheep in the Grain Belt should be a part of a mixed crop and livestock farm. In most parts of the world, sheep are not the only enterprise on tillable cropland. They are employed as integral components of cropping programs by assisting with weed control and soil fertility, and in marketing crop residues. Photo: Janet McNally. To smooth the weaning process, the Boettchers set up a temporary pen and chute, and allow lambs to play there for a few days before they’re sorted. Son Martin is in foreground. With the right approach, sheep are a very profitable addition to such farms. Modern agriculture has encouraged mono-cropping, with fertilizers and farm chemicals replacing livestock as crop management tools. Mono-cropping livestock has been a growing trend as well. With this approach comes problems such as sheep pests (parasites) that require higher input costs and reduced returns. 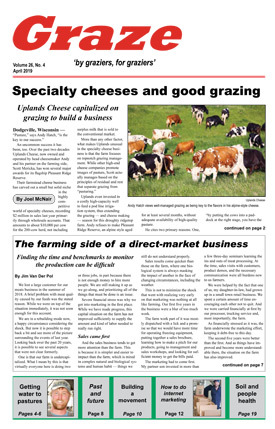 Indeed, midwestern sheep producers have struggled with how to make the farm flock a profitable business, especially on higher-priced land or when sheep are the only enterprise on the farm. While the highest lamb prices in history are providing profit for most people, the long haul is uncertain, as those prices are being partly fueled by the U.S. decision to devalue the dollar as a strategy to manage our economic woes. So there is great potential for a roller coaster ride in the lamb market. The high prices will also encourage inefficiency, which will lead to unprofitable sheep operations when costs catch up to prices. So I was delighted to visit the Chris and Gabriele Boettcher family in Ontario, Canada. I think the Boettchers have put the pieces of the puzzle together for a profitable sheep enterprise on tillable land. For Chris, being organic means applying livestock manure and plowing down green manures to fertilize crops rather than purchasing commercial fertilizers. Their main cash crops are organic spelt and soybeans, but they also raise organic oats and rye — and sheep. The rotation of seed crops, green manure crops and sheep grazing feeds the soil and the flock while producing high-value, marketable grain crops, along with lamb and wool.Green manure crops are legumes that fix nitrogen in the soil. They also make superb sheep feed. When planting spelt, Chris underseeds 5 lbs.of red clover/acre, harrows it in with a rotary harrow in the spring, and has the sheep graze this green manure following the fall spelt harvest. For his hay/green manure mix, Chris uses a wider variety of legumes and grasses that are also broadcast into rye or winter spelt in the spring. The mix includes: Leo birdsfoot trefoil (5 lbs./acre), alfalfa (0.5 lb. ), ladino clover (0.5 lb. ), sweet clover (0.5 lb. ), timothy (1 lb. ), Kora tall fescue (1.5 lb. ; being evaluated), Carleton brome (4 lbs.) and Fleet meadow brome (4 lbs.). The last two are applied separately because of their large seeds. Sweet clover puts down a very deep tap root, bringing minerals to the surface. Birdsfoot trefoil is preferred to alfalfa, as it is easier to manage, and offers less bloat risk and a higher mineral content. Chris prefers low-alkaloid reed canarygrass or brome in the mix because they are softer and sweeter. This mix will remain for two years, and then be plowed under. While it is standing, it is hayed and grazed. In oat fields, he disks in the oat residue after broadcasting a blend of legumes and bin-run oats, and later turns the ewe flock in on 18 inches of green feed for flushing. Chris figures the sheep leave behind two tons of manure and urine per acre. In addition, five tons per acre of composted manure from the lambing barn is applied when the forage land is broken up after two years. If Chris did not have sheep, he figures he would be exporting minerals and nutrients off his farm in the hay made from the green manure forage. By grazing the flock on that crop, 80% of the nutrients are cycled back to the land. He strives for a rotation where an acre spends four years as tillable land producing grain (plus late-season green oats or red clover crops for grazing), and two years as a forage crop that is hayed and grazed by the sheep. The sheep have a long-term rotation of their own. With such a diverse cropping program, they are continually moving on to the next grazing area, allowing Chris to keep them off any given piece of ground for up to 12 months, thus eliminating the need to drench for parasites. He employs high stocking densities, and sheep are moving to fresh pasture daily. After weaning, Chris will graze 510 lambs on one acre per day, or the equivalent of 80,000 to 100,000 lbs. of animal per acre. With such high-quality grazing and the Boettchers’ commitment to organic farming — hence no vaccinations — they used to lose some lambs to enterotoxemia type D, known as “overeating disease.” By leaving a strip of forage unmowed and including a piece of this strip in each paddock to provide some mature fiber, Chris has been able to stop the losses during the transition period from first-cut forage to lush, second-cut growth. The Boettcher flock consists of 360 Canadian Arcott ewes on about the same number of acres. They are lambed indoors at the end of March, and the adult ewes drop an impressive 2.12 lambs per ewe, with lamb mortality under 9%. Chris figures the sheep return back to the cropping enterprise approximately $50 (Canadian) per ewe annually in increased yields, plus the value of fertilizer. Annual sales of lambs, culls, and wool total $230 per ewe. Chris charges his ewes 40 cents per day for grazing, and $60 per year for homegrown harvested feeds. The only purchased feed is trace minerals and flax meal. He figures his return to labor, risk and management to be $88.65 per ewe. These figures were for 2008 — before the historic rise in lamb prices! 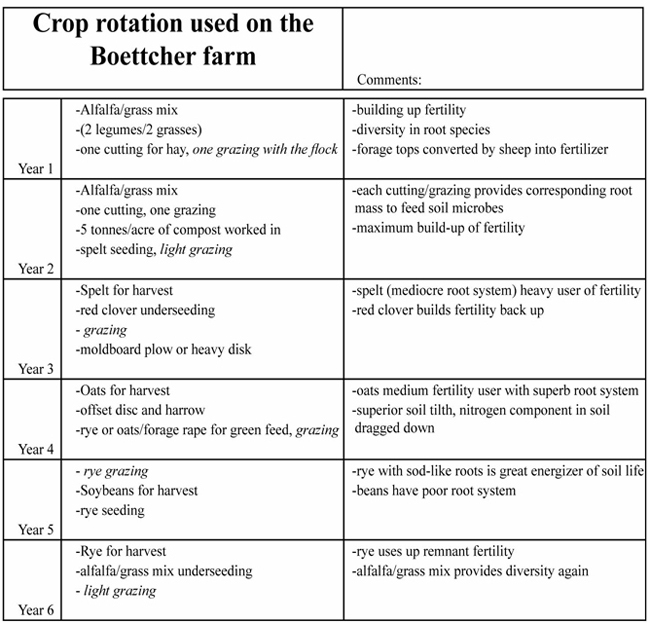 The Boettcher farm exemplifies how a mixed crop and livestock farm enhances the profitability of both crops and livestock by sharing costs such as land, and through the synergy of complementary enterprises. Equally impressive is that children Erik, Martin, Olaf, Peter and Ingrid are all involved in the farm business. They plan to study agriculture and work on farms abroad. What if everyone in my home county farmed like the Boettchers? Pine County, Minnesota, has 103,000 acres of tillable land that could support 103,000 ewes happily munching away on weeds and crop residue as an added farm profit center. Instead, Pine County is home to a mere 1,000 ewes, half of which reside on just two farms. Cash crops have always been a rather marginal business here due to poorer soils and a short growing season. A simple change in mindset just might be the ticket to improving farm profitability.